When someone walks in front of the block with the sensor, motors turn on that have razors, it makes an annoying alarm sound, lights flash red over and over and servos turn and point at you. We used wood, two servos, two motors, two multicolor LEDs, hummingbird, laser cutter, Hot glue gun and computer. Some things that were hard is that we couldn't get the servos to turn the right way but finally they turned the right way and same way. And when something was a problem we thought about it and tried things over and over till there right. The most fun part testing out the project and seeing the final product. I learned how to use the laser cutter very well to the point I could do it on my own. Something we tried but didn't work was we tried doing two different expressions at one point which did not work because it didn't make much sense and stuff. If I chad more time I would add a sign that pops up when you go in front of it that say intruder alert and then also the computer says intruder alert. When you turn the Motor controller the ball spins and you can control the speed. There is also a button glued down on the side to turn off and off the lights. 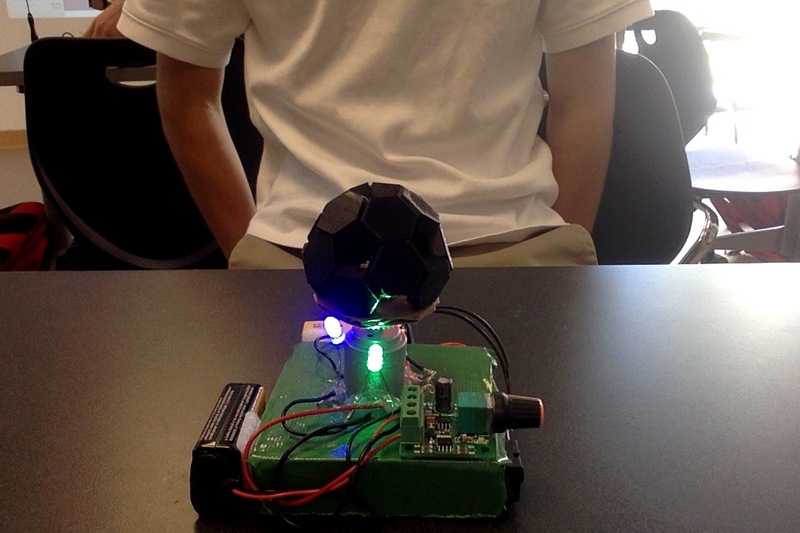 Materials: Leds, motor, batteries, wires, switch, soccer ball, cardboard and motor controller. I used soldering iron, hot glue gun and screw driver. The hardest part was keeping the wires organized. The most fun was soldering the wires and the leds and stuff. I learned how circuits work and I got much better at soldering. If I could change something I would make it so the ball would spin slower and the lights were inside the ball. Theres a video on Seasaw and here is a photo and I don't have a photo of early stage I did not know I needed one and I can take a picture of my sketch next class. Marshall and I have built a car. It has two eyes that are green when it's going forward and when something is in front of it its eyes turn red and it turns 90 degrees then goes forward again. 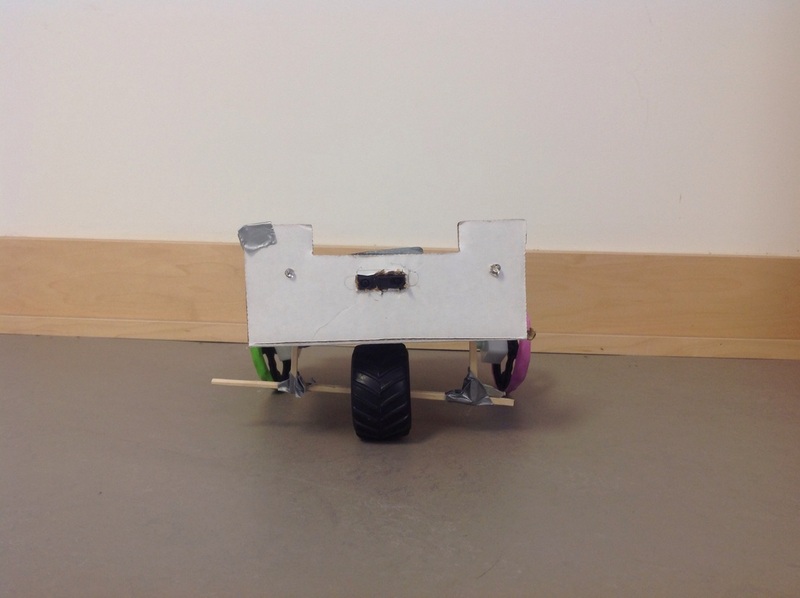 We used cardboard to build the base, chop sticks to support the wheels, duct tape, rubber bands for the wheels traction, 2 3d printed wheels and one plastic wheel. Next time I would make it better support for the wheels instead of chopsticks and duct tape. I would also add a top. 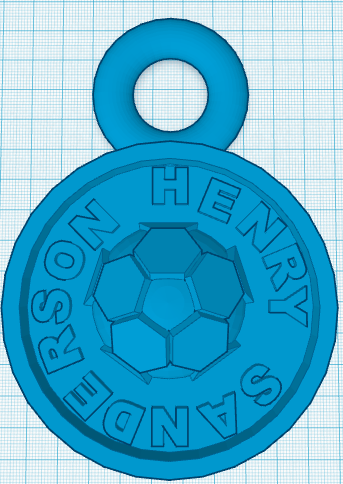 In Creator's Studio this week, I created I have created a keychain for my soccer bad in TinkerCad to 3d print. In TinkerCad I first got a circle then raised it and put a whole so there are edges then, then I put my name in. Next I attached a circle with a whole in it. Finally, I downloaded a soccer from online then took a box and put it in the bottom half and made it a whole then, i put it on the keychain. My idea is to make a car out of different kinds of tin cans and if it senses something in front of it, it turns or something to do with soccer. I would have motors on the inside and wheels. I am interested in doing this because I never thought about a mini car works. I would need cans, circuits, motors, wheels and maybe too use the 3d printer.